Protect your devices from malware attacks – The latest version of our software now offers complete malware protection! Everyone of you have a Gmail Account, and probably read, Write and send mail from your Gmail email Account. some time you are surfing internet or using your computer but you don’t check your Gmail for new Emails. by doing so, you might miss an important email from some one. so, in this case Kwerty Gmail Notifier is here to help you. with Kwerty Gmail Notifier you can Get new Gmail Notifications on Desktop. 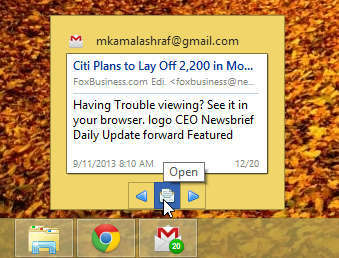 Kerty Gmail Notifier is a free and very useful Windows Software which can notify you about new Emails. this software is very small in size. 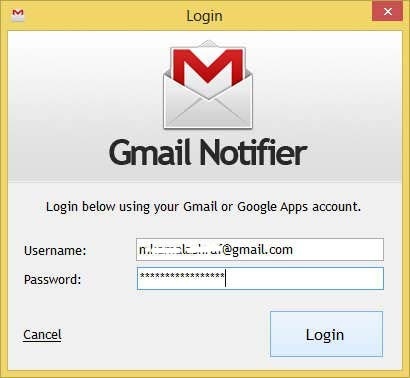 When you download and install this software, sign in with your Gmail account. 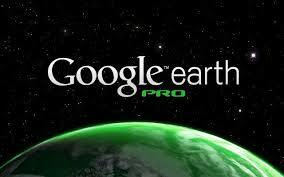 his software also support Google Apps Accounts. you can check your New Emails directly from this software without going to Gmail.com. Kwerty Gmail Notifier will show you the preview of your unread emails, as Kwerty Gmail Notifier is specially made for Windows 7 and Windows 8.
there are several options in this software. you can customize the settings according to your need. 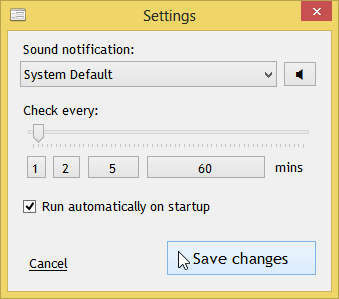 like new email sound notification, and check New email every “X” Minute. 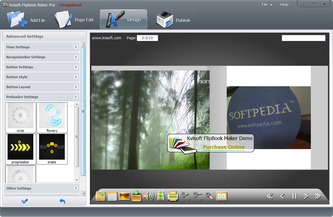 Kvisoft FlipBook Maker Pro, a helpful Flash page turning software, offers you a professional but easy way to design 3D animated flipping page publications from PDF, images and flash movies. A nice program for anyone to generate digital publishing creations like digital magazine, flip catalog, page turning ebooks etc. The new-designed Flipbook Maker Pro makes it more intuitive for users. 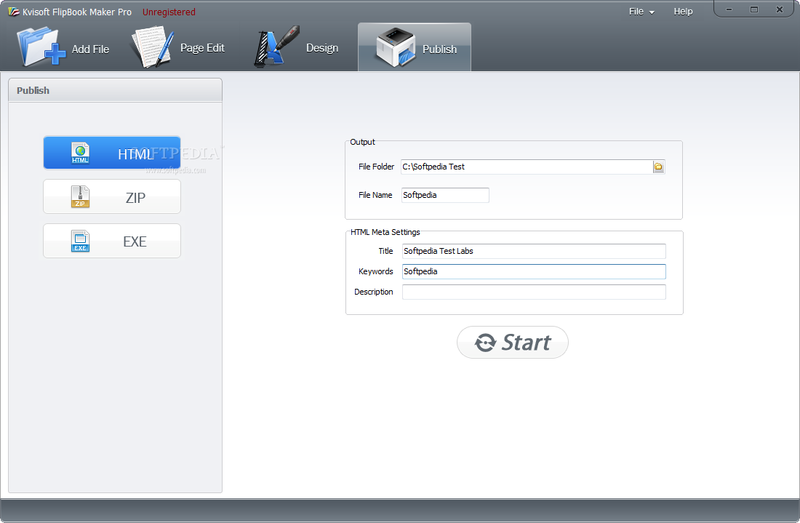 Once opening the page flip software, you will see four main buttons: Add File, Edit Page, Design and Publish. Well, the flipping publications creation work is so easy within only four steps. 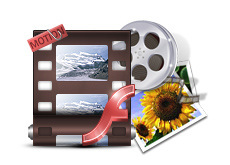 Besides importing PDF files, you also can import Flash movies (.flv, f4v, mp4 and .swf), images (.jpg, .png, .bmp, .jpeg, gif) into page flipping book pages. So, it would be a nice tool to make online flipping digital publications and video flash magazines. 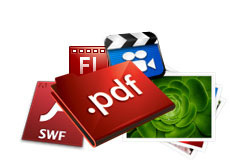 Adding multimedia to your PDF pages is very simple. 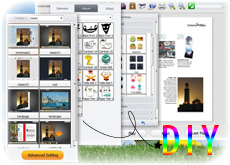 You can addtext, hyperlinks, video (YouTube video included), Flash movie, images, hotspot, clipart, and sound to output PDF flipping pages and enrich your digital magazines. 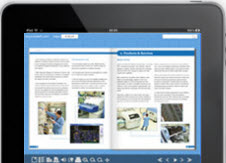 It would be a good tool to enhance the reading experience of your PDF digital publications. Mobile Device SupportMake digital publications and run on mobile devices like iPhone, iPad, iPod and Android-powered devices. It's more easy for you to view the publication on the go and share the turning page ebooks with anyone around the world, no matter PC or mobile readers. Only a browser is required in a mobile device to get it work. Convenient to drive everybody to view your animated flash magazines or digital publishing work. 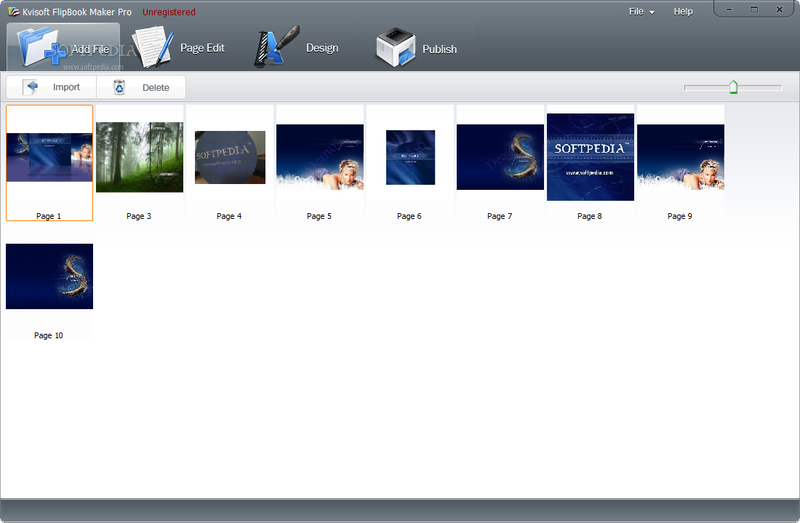 Flipbook Maker pro provides you a lot of useful pre-set templates for you to quickly make attractive page flipping books. Moreover, you can design your own custom style themes with built-in setting functions: navigation bar setting, button settings, thumbnail style, preloader settings, background image and music, and other powerful settings. All texts would be indexed by search engines after converting PDF to Flash magazines. The page flipping books are SEO friendly. You also can do in-page SEO optimization work (define page title and meta data) for web and everyone can find your digital magazines via the internet. 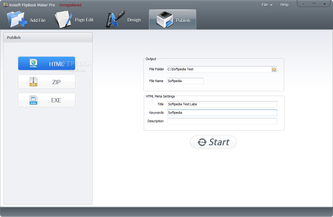 Output interface: this page flip tool allows you to define multiple languages for the user interface; readers can view the publications with their favoriate language interface. 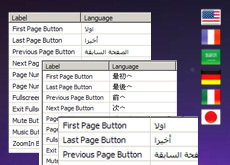 The built-in languages including: English, Japanese, French, German, Arabic and Italian. You also can add other languages by yourself easily. Software interface:it can also be localized. You can select the setup language as English, France, or Italian. 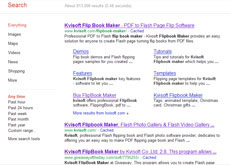 The Flash flipping books created from PDF via Flipbook Maker pro provide the proper means of integration with popular social network sites. Viewers can share the flash flipping book to Facebook, Twitter, LinkedIn, Digg and more sites or E-mail or copy it to others. Extend the power of Google Analytics in your digital publications. By inputting your Google Analytics account ID in the publishing flip book, you can monitor and analyze the traffic of your online flipping book with ease in your Google Analytics account live. 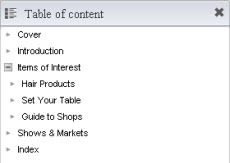 Nice way to increase your marketing effectiveness using Google Analytics within the publications. Output to MAC executable file (APP). Convert it to page turning book as stand-alone EXE for CD delivery. Produce ZIP package and email it to your customers. 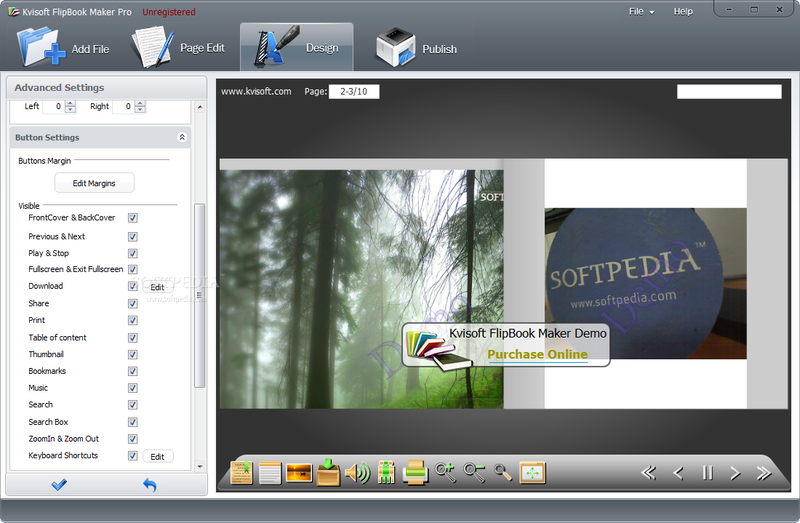 Kvisoft Flipbook Maker Pro lets you convert PDF to page flipping books for easily distributable and accessible from anywhere in the universally viewable Flash format. Add videos to pages, live You Tube video supported. 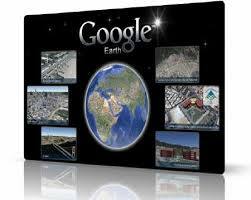 Publish it as HTML which allows you to upload to a website to be viewed online. It also provides the HTML code to for webpages. "Kvisoft Flipbook Maker Pro is a reliable software designed to convert your PDF files to page-turning digital publications." 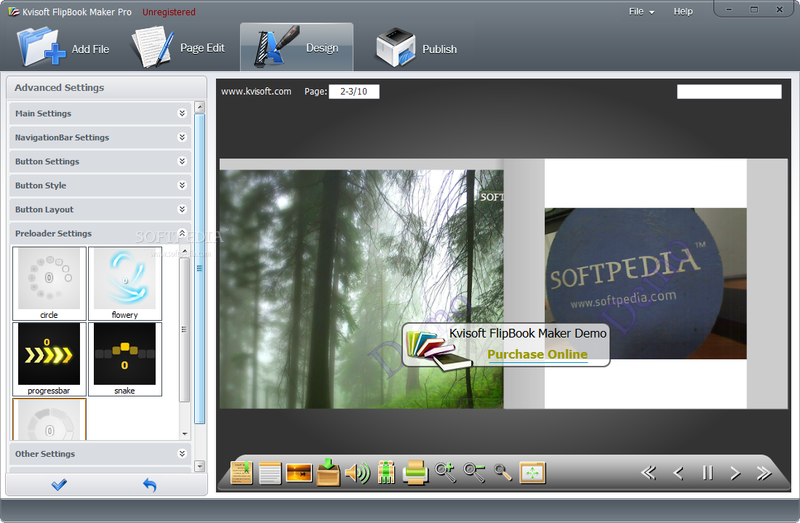 "Kvisoft Flipbook Maker Pro will enable you to add various graphic elements to your projects." "With Kvisoft Flipbook Maker Pro, you will also be able to personalize your flipbooks with clipart items." This simple software will read Picture Metadata and would calculate age of a person based on the date the picture was taken. Then it will write age on picture just like a time stamp. Good for those who want to keep a record of their pictures age-wise. What's new in this version: Version 2.0 is a bug-fixing release. Sometimes we get to try the most unique, unusual, and specialized software. For example, take SoftWeird's Pic-Poster. This unusual free tool analyzes faces and image metadata to estimate an individual's age range, based on initial data you enter. You can post your images online to view or share, too. It works with a wide range of images, but it's meant to be used on digital snapshots of individuals (like newborns) bearing date stamps and other metadata. Its chief purpose seems to be to help busy parents quickly sort through gigabytes of family snapshots without the help of a team of professional archivists and perhaps the Smithsonian (if you want it done this century). Used properly, Pic-Poster actually works, after a fashion. Pic-Poster's user interface is fairly simple but not especially intuitive, and the interface language seems to have lost something in the translation; many of the commands had confusing syntax (like "Wait sometime") and we saw frequent misspellings. We started by clicking a very long button labeled Load Post Age On All Pictures In a Folder, which actually translates as something like "browse to load images." We did, and our batch of image files appeared in a list view in the program's sidebar, with the first image previewed in the main window. 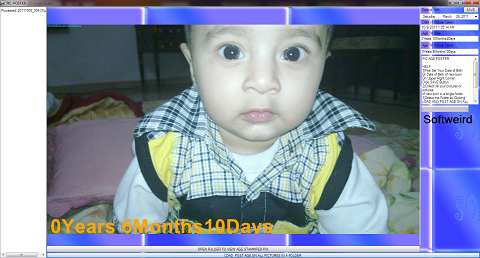 On the right side were fields for Date of Birth, Date of Picture Taken, Age Till Date, and Age Till Picture Taken. Apparently, Age Till Date means current age, and Age Till Picture Taken means the individual's age when the picture was taken. The program's instructions appeared in a small window labeled Pic-Age Poster Help, which seems to be the same tool by a different name. Basically, the idea is to gather all the images of an individual in a single folder, enter the date of birth, and then wait while Pic-Poster analyzes the images and stamps them with age data, a process that takes some time. And how does it work? Well, well enough to make this fascinating freeware worth trying, as we discovered with our small sample. For most parents, giving Pic-Poster enough material to work with won't be a problem. This program intends to load itself on system startup and monitors system turn off sequence. If system turns off abruptly due to power-failure, which is mostly caused by load-shedding. This program adds that time into its list for turning off system. Next day on the same time computer automatically turns off before power goes out. To Save Data and Disk. The sole purpose of this program is to Automatically Add the Hours of Load-Shedding to a list and then turn off system before light goes out and might damage data. What's new in this version: Version 1.82 fixes not loading settings bug. Coolcolor Text Generator is a program that allows users to generate some colorful text for web pages, Blogs, MSN Spaces and Topics. You only need to enter your text in Coolcolor Text Generator and choose your favorite color style, it will generate HTML or BBCodes for your text. I remember a time when I'd be in elementary school and I'd see all those popular people passing around notes. You know what I'm talking about, those stupid little notes with Bobby loves Susie or something close to it. Don't lie, you all did it. I remember all the girls in my class would take up whole hours changing colored pens, and making rainbow colored masterpiece recreations of drawings while writing notes. If Jessica only spent more time listening to what was going on, maybe she wouldn't have been kept back a grade� but 'c'est la vie' I guess. I can't lie when I tell you that I didn't feel like a sixth grade girl writing notes when I was testing out this program. Honestly, I did. But I'd have to say that if you don't want to write it all out yourself and change each individual color, then I'd recommend you mess around with this program. For actual use, aside from school girl notes, you may find it to your liking that this program is designed with the Web oriented people in mind. For those of you who have a little creativity combined with a whole lot of laziness, this is your fun tool of the day. Coolcolor Text Generator works with a pretty simple interface. It's a one windowed program that shows your text at the top, lets you input your text in a text bar right underneath. In the middle of the pane you get some text options and finally underneath it all you're given the HTML and/or BBCodes. For the options, you're not going to get anything excessive, so don't get your hopes up, but you do in fact get some nifty little settings you can tweak. Aside from choosing from a whole lot of text types, you're also able to choose if you want the text bold or italicized. You get three different color types to choose from as well (Rainbow, Gradual Color or Random Color). This is basically saying it randomly changes your font and capitalize some letters. Bottom line, for those coders who don't want the hassle of changing each letter, this program will take the hassle away from those that don't want to sit in front of their computers and code all day long. Aside from reliving those memories of when you were awkward, had pimples and didn't know arithmetic? Yes it has some good functionality for the HTML users who don't want to code. 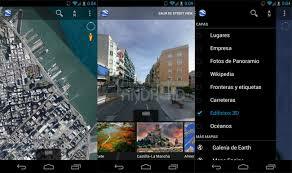 You have many color features and a few options that make it worth the trial download. Well, I can't find too many bad things about the program because it works. I'd like to see some more text options though. Maybe inverting all the capitals to smaller case letters and so forth. If you're looking to have a little fun with text, Coolcolor Text Generator is a program that can supply you with just that (but not too much though). The interface is simple and intuitive enough to use and you can make all the funky, colored, rainbow text your heart desires. Coolcolor Text Generator is a tool which allows you generate some colorful text for your web pages and Blogs. Portable Coolcolor Text Generator v 1.0 is a little application, which allows you create Rainbow, Gradual color and Random color style text for your web pages. These three text style have their own parameters. It can convert your text into code, that can be past in any three forms. It cannot mention the space, so the words will be seemed to be combine with each others, so you can separate them according to your requirements.Simply enter your text in Coolcolor Text Generator and choose your favorite color style, it will generate HTML or BBCodes for your text. Supported with Microsoft Windows 98/ME/2000/2003/NT/XP and Windows 7. When talking about cricket matches, we use two options to get the scores. One is watching it live on the cricket or web. Next option is to check espn cricinfo. Today we have got a nice little app that shows cricket match score cards on your desktop similar to cricinfo live scorecard for desktop. Previously we had told you about the Cricinfo chrome extension that allows you to get live cricket scores on your browser. We had also discussed about Live Cricket score mobile app from Espn Cricinfo. Do you know what ? If you own or write about cricket on your blog, website then you can embed live cricket scores on WordPress blogs. Now coming back to the topic, today we have a small freeware that displays live cricket match scores and full details in a simple intelligent user interface. 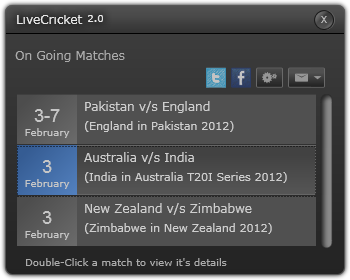 Live Cricket is a simple free app that shows live cricket score on your desktop. Totally ad free and shows every detail about the teams, scores, individual person scores, current run rate, bowling details etc. All you need to do is, just download and install it. It sits on your right side of your desktop screen. When you click it, it displays the current on going match with score details. 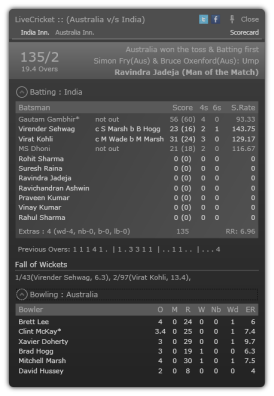 If you double click it, it displays the full scorecard with all batting and bowling details. You can change the update frequency with the settings. As said above, it sits on the right of your screen, you can move it up and down anywhere on the right side. Sad that it can’t be moved anywhere towards left or center. But you can pin it so stay at top always. 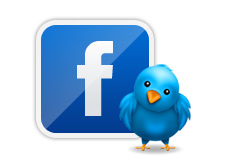 Add news feeds from other websites too! Cricinfo Desktop Alerts will work on most Windows computers. You will need an internet connection to pick up messages. 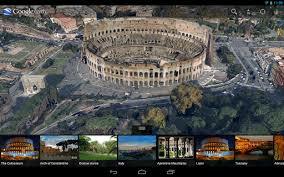 Features:– Sophisticated streaming technology delivers the data to you as you need it.